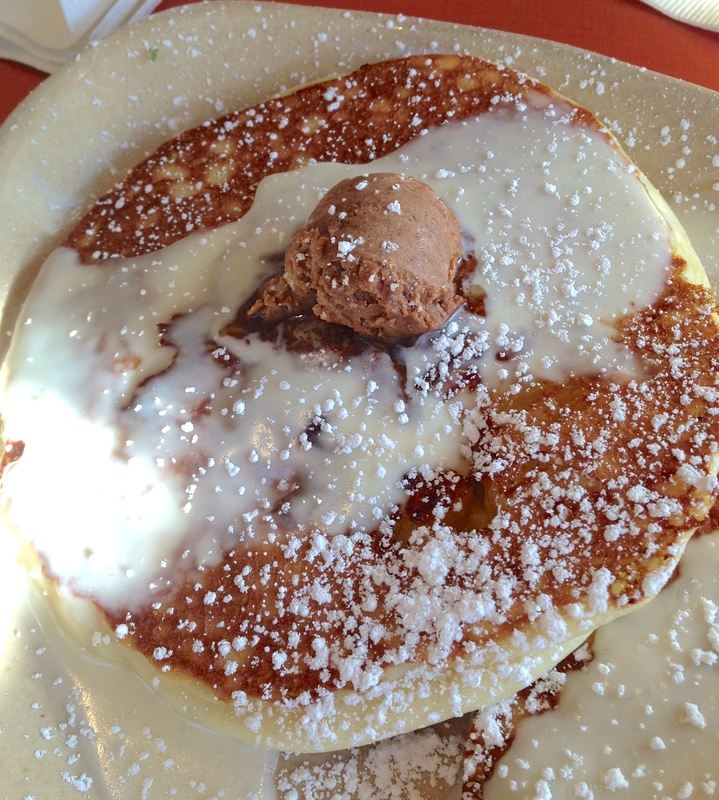 When I was in San Diego on Sunday morning, I did a quick Yelp search for the best brunch. 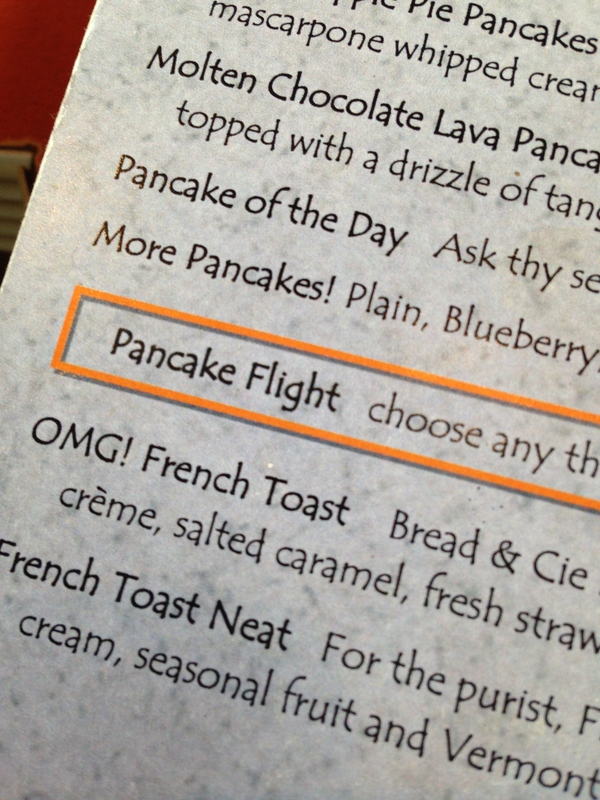 I was contemplating a few places, until I saw a review that mentioned a Pancake Flight. I didn’t need to see any more. I was headed to Snooze, an AM Eatery. Snooze is located in the Hillcrest neighborhood of San Diego. 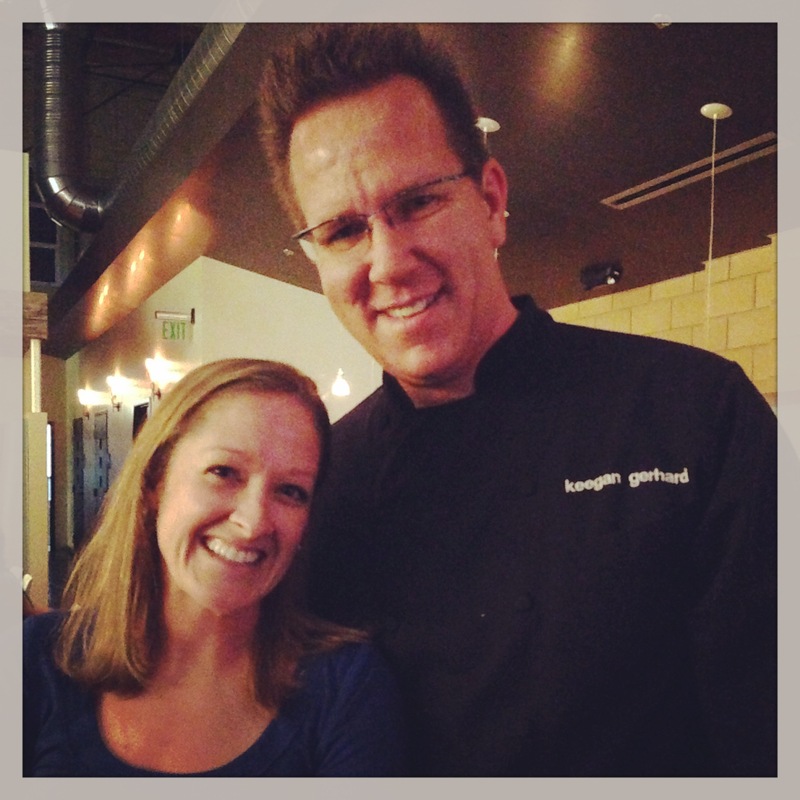 I didn’t realize it at the time, but it is right next to D Bar, where I met up with my SOAS teammates and got my picture take with the (celebrity) head chef, Keegan Gerhard. I digress- we’re here to talk about PANCAKES! 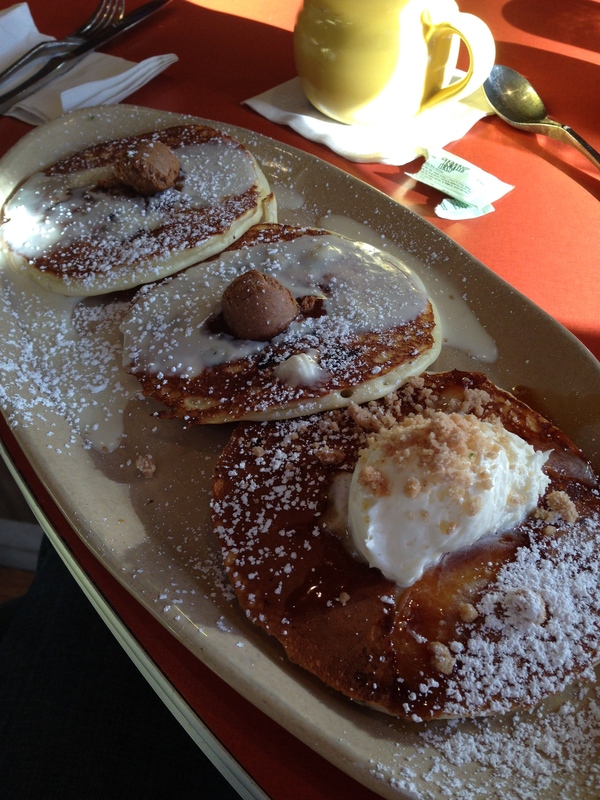 Snooze offers quite the variety of pancakes- check out their menu– and I had a tough time deciding which I wanted. The Pineapple upside down cake came highly recommended, so I included that in my order, along with a cinnamon roll and caramel apple pie. I could hardly wait for them to arrive! There was a little mix up in the kitchen and I got the pancake of the day (oatmeal chocolate chip) instead of the cinnamon roll, but I was too hungry to send it back. I could go for a little chocolate anyhow:-) The other two were just as I had ordered and OH SO GOOD! It seems like the chef at Snooze focuses on having a really good buttermilk batter, to which he/she can make tiny additions to blow it out of the water. The caramel apple had slices of apple on top, a caramel sauce, and this outta control marscapone whipped cream. 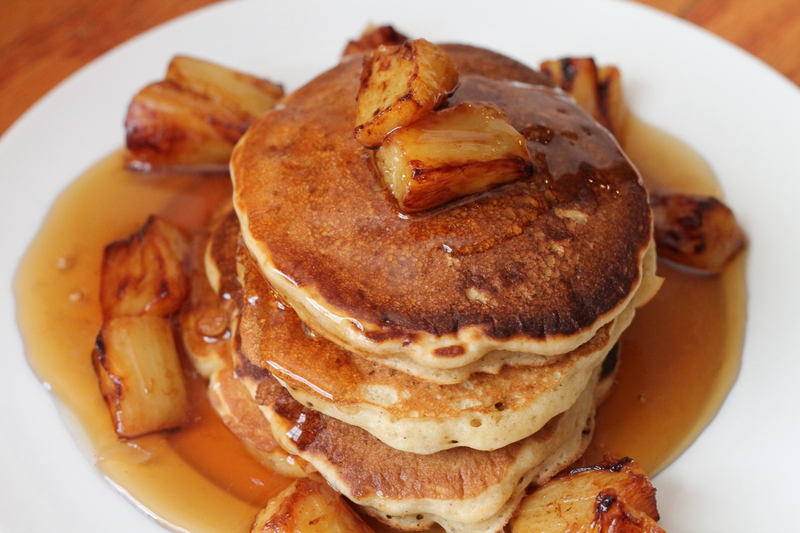 The pancake that stole the show though was the pineapple upside cake. The pancake had these tiny pineapple chunks that were mini versions of what you’d get in the can- they didn’t seem to be the “crushed pineapple” though. The pineapple was complemented by the cinnamon butter and creme anglaise on top. YUM. It was my own version of pineapple upside down cake! Sure, I didn’t have the compound butter or the creme anglasise (um, but definitely want to next time!) but I thought my pancakes tasted pretty darn good. 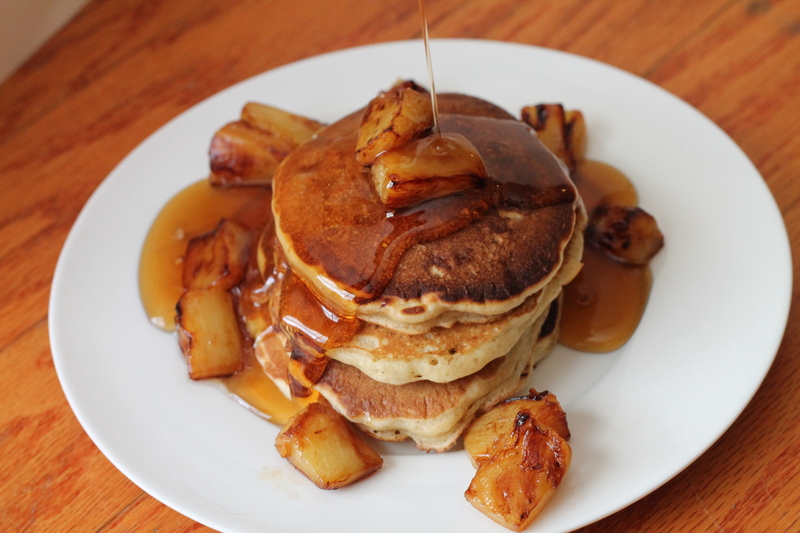 I caramelized the pineapple with some brown sugar and butter (and probably would have added some rum to set on fire if Bill had been around)- which I think took these to the next level. My recipe is a little involved (and because I didn’t take good notes while I was making them over a week ago)- so feel free to make additions/changes as necessary. I think I’d make some swaps next time- i.e. 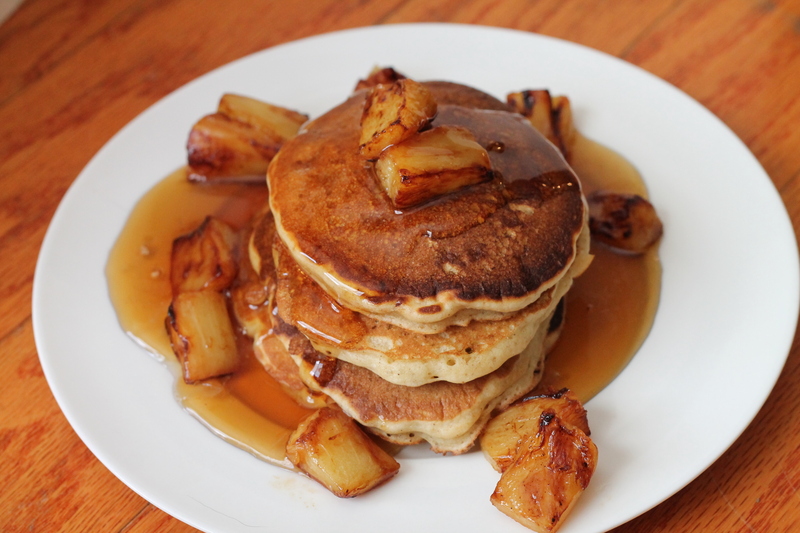 use crushed pineapple in the batter rather than cutting the chunks, and use more pineapple juice. 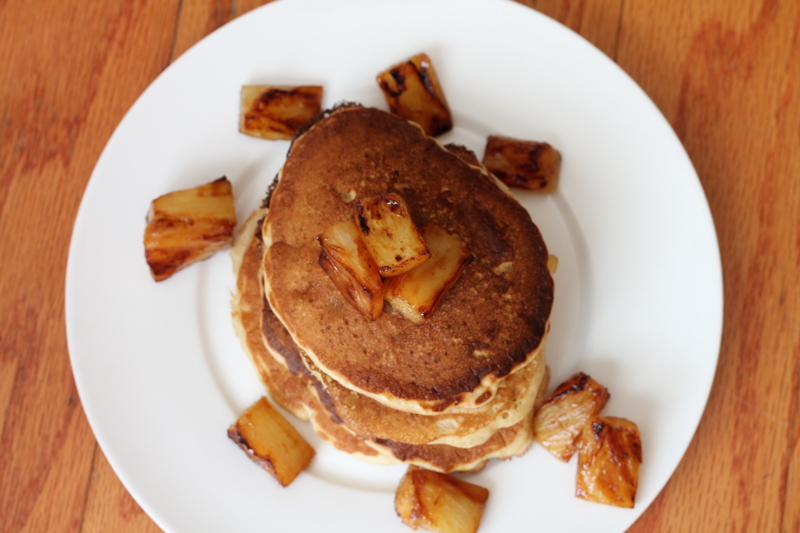 Brown sugar + Pineapple is an EXCELLENT combination! 1 TBS Brown sugar + 1 TBS butter warmed in a saute pan. When it is a goopy mixture, stir into the batter.